The periodic stoppages are needed to allow for hoisting and placement of steel beams for the new approach bridge that will carry I-295 across the Delaware & Raritan Canal and the Route 29 NB bypass roadway immediately before the bridge. When completed, the new approach bridge will be the highway’s connection with the soon-to-be-completed upstream span of the new Scudder Falls Toll Bridge. Stoppages can occur any time between 10 p.m. to 6 a.m. (next day) on Monday, April 1, through Friday, April 5. Also next week, off-peak single-lane travel patterns are expected to resume in the Pennsylvania-bound direction on the Scudder Falls I-295) Bridge. This travel restriction is needed to facilitate deliveries of concrete for the road deck atop the new bridge’s upstream span. Motorists using I-295 NB on the New Jersey side of the bridge are advised to allow additional time to reach their destinations or plan alternate routes on mornings when concrete deliveries take place — between 2 a.m. and noon on intermittent weekday/Saturday mornings when there is no rain forecast and sustained overnight temperatures exceed 35 degrees. 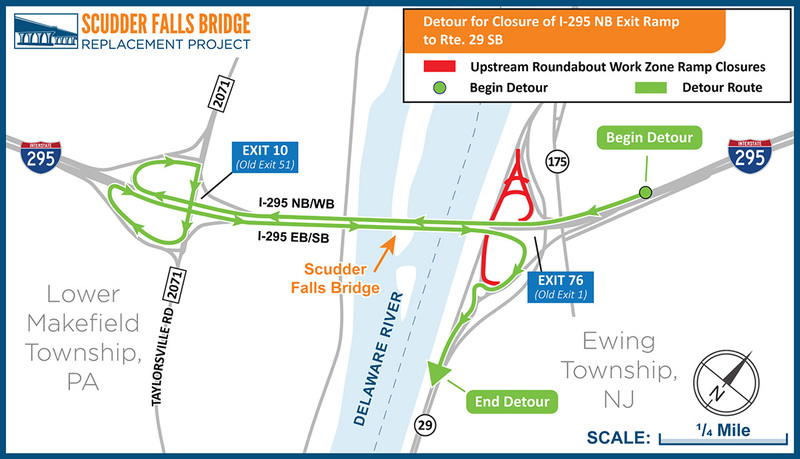 I-295 NB/WB (old I-95 SB) approaching the Scudder Falls Bridge Pennsylvania-bound– Single-lane travel patterns possible 7 p.m. to 2 p.m. (next day) Monday, April 1, through Friday, April 5, 7 p.m. to 2 p.m. (next day). Note: Within these time periods, single-lane travel is possible on the Scudder Falls Bridge for concrete deliveries 2 a.m. to noon Tuesday, April 2, to Saturday, April 6 (weather permitting). 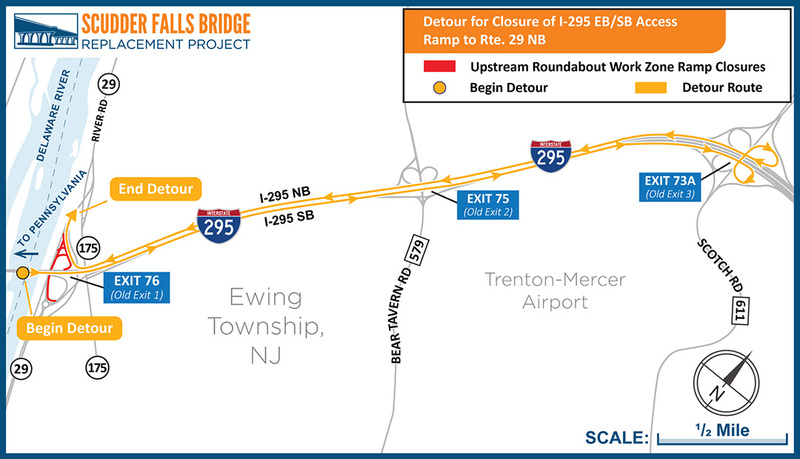 I-295 EB/SB (old I-95 NB) crossing the Scudder Falls Bridge into New Jersey – Intermittent single-lane travel patterns 10 a.m. to 4 p.m. and 6:30 p.m. to 6 a.m. (next day) on Monday, April 1, through Friday, April 5. Route 29 NB bypass roadway– Intermittent short-duration, flagger-controlled stoppages 7 a.m. to 5 p.m. Monday, April 1, to Friday, April 5; AND intermittent flagger-controlled stoppages of traffic 10 p.m. to 6 a.m. (next day) Monday, April 1, through Friday, April 5. Route 175/River Road – Intermittent alternating single-lane travel patterns 6 a.m. to 6 p.m. Monday, April 1, to Friday, April 5; AND OVERNIGHT closure with posted detour 10 p.m. to 6 a.m. (next day) Monday, April 1, through Friday, April 5. Note: Motorists seeking access ramp to I-295 SB (old I-95 NB) should use the new on-ramp off the downstream roundabout at the nearby Route 29/I-295 interchange. 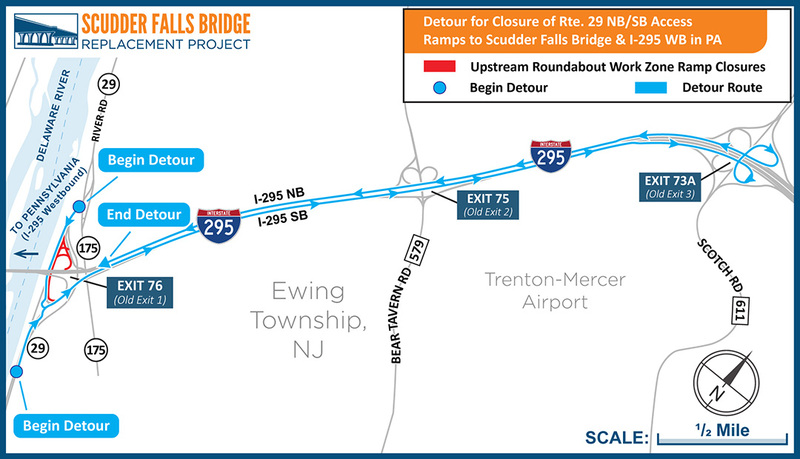 I-295 EB & WB in the vicinity of the Scudder Falls Bridge –Off-peak single-lane travel patterns possible due to construction/demolition along I-295 on the NJ side of the Scudder Falls Bridge Monday, April 1, to Saturday, April 6. Note: Possible concrete deliveries on the bridge mornings of Tuesday, April 2, to Saturday, April 6. Taylorsville Road north of I-295–Intermittent single-lane patterns with possible flagger-controlled travel 9 a.m. to 4 p.m. Monday, April 1, to Friday, April 5. Taylorsville Road south of I-295 –Intermittent single-lane patterns with possible flagger-controlled travel 9 a.m. to 6 p.m. Monday, April 1, to Friday, April 5. Woodside Road – Intermittent right or left lane closures with passage maintained in each direction and/or flagging-controlled travel 10 a.m. to 6 p.m. Monday, April 1, to Friday, April 5. PA Route 32/River Road – Intermittent alternating traffic controlled by flaggers 7 a.m. to 5 p.m. Monday, April 1, to Friday, April 5. Weekends:Aside from any Friday overnight travel restrictions extending into Saturdays, the overnight restrictions at NJ Route 175/River Road, and the uninterrupted 24/7 ramp closures on the upstream side of the I-295/Route 29 interchange, no other lane closures and detours are scheduled for the weekends of March 30-31 and April 6-7. NJ side –Intermittent daytime and nighttime closures of the Delaware & Raritan Canal towpath segment in New Jersey are extended through April. (Closures needed for overhead girder installation and bridge deck construction.) Note: Towpath will be accessible for opening day of fishing season Saturday, April 6. PA side –Occasional weekday closures of the Delaware Canal towpath segment in Pennsylvania until June – but open on weekends.